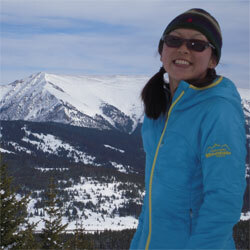 The Marmot Dena Jacket is a women specific synthetic insulated jacket. Not only is it warm, light and durable, it also uses recycled or discarded materials that otherwise go to landfills. So, in essence, it is double light (i.e., on weight and on the environment)! I tested this jacket backcountry skiing in Rocky Mountain National Park, Vail Pass, and Red Mountain Pass in the San Juans, as well as ice climbing in Ouray. It is a perfect layer on a cold or snowy day in the mountains. The hood works great over your ski hat to give some extra warmth. It’s also a good piece to throw in your backpack as an extra layer since it only weights about 12oz. In addition, I must mention that my Dena Jacket is a feminine light-blue color. I received numerous compliments from several women while walking and skiing around the Vail Resort! 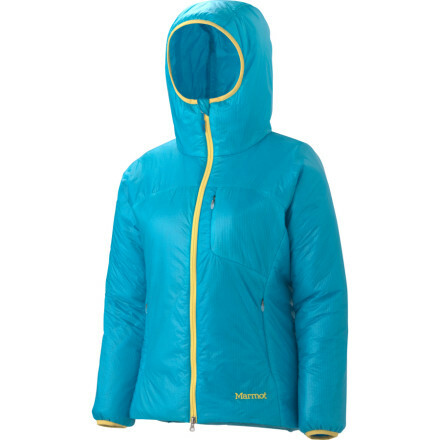 Adding the Marmot Dena over my Marmot Oracle jacket worked great. It easily fit over my ice climbing harness and kept me extra warm on a cold bitter day. The jacket features something called “Angel-Wing Movement”. This fancy feature allows full range of arm motion which really helps when you are swinging your ice tools. This has become my favorite go-to jacket on a cold day. So if you tend to get cold in the mountains like I do, try out this jacket. And if you want to stay warm and still look good, check out the light blue color, you will not be disappointed! Do you need info on eating disorder transitional living? It can really make a difference in your recovery.